Back in the 1930s when the school extension was being built classes were held in the hall behind Church Street. This carried on for about a year. 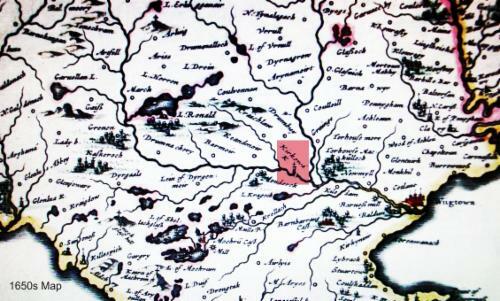 'OUT OF THIS WORLD AND INTO KIRKCOWAN' - This expression reputedly originated before 1765 when the village or clachan was 'considered so remote before the formation of military roads'. The saying has lasted well beyond its origin and is still used extensively today. A poem of this name exists but I have been unable to discover its origins. On this map the place names are spelled differently but many are still recognisable. you may need to increase the magnification of your screen to read the names. During the Napoleonic Wars each parish had to supply men for the Militia. All eligible men has their name put in a barrel and the required number were drawn out. If your name was drawn out you had to report for duty or supply a substitute - this resulted in willing volunteers being paid to substitute. These men were mostly under the command of the Earl of Stair. In December 1798 two men were selected from Kirkcowan Parish: James Milligan, son of Peter Milligan, tenant in Kilpockadale (never heard of it - have you?) and Alexander McGuifog, carpenter in Kirkcowan (it is not known whether they reported themselves or found a substitute). Back in 1962 & again in 1982 Kirkcowan was visited by interviewers from the School of Scottish Studies which was making recordings of Scottish History. This included songs, music, stories, customs, beliefs etc. Many of the songs and stories are no longer sung or told in the towns and villages they came from. In 1962 they interviewed Tom McGaw, his son Pete and daughters Agnes and Meg. In 1982 they returned and interviewed Margaret Muir and her brother David Laurie. These recordings still exist and it is hoped that they will be added to the website www.kistoriches.co.uk whose aim is to preserve these recordings and others by the BBC and National Trust for Scotland. I have managed to make contact with the families concerned for them and both families have agreed that the material can be included on the website. Formal permission will now be sought by 'KistoRiches' and the material will eventually appear on the website. I am also being provided with copies of the recordings and hope to extract some stories for this website - watch this space. There are already many recordings on the website including some by Bob Adair who used to be the blacksmith at Malzie Smiddy - have a listen to the authentic Wigtownshire accents of Bob and others. Click here to go to the website, then select Wigtown on the map to get to the list of recordings. Each summer travellers (called tinkers in those days) used to park their wooden horse drawn caravan in a layby on the back road from Mindork near Gass farm. They would go round doors selling clothes pegs they had made etc. Does anyone remember these two local characters? Cumberland 'Lil' was a tall thin woman who lived near Barlae and walked everywhere - the local children all ran indoors when they saw her coming- by all accounts she was harmless but children have powerful imaginations. 'Snib' Scott was a gentleman of the road and was often wandering through the area- why was he called 'Snib'? In the 1960s a group of children set up an unofficial 'toll' gate on the Kirkcowan to Drumwalt road, near Mindork. They would open and close the gate for motorists and were given a penny or two for their trouble. When a reasonable amount was raised one of them would cycle into the village to purchase sweets etc for their picnic - I wonder what heights these young entrepreneurs have risen to. Every week school dinner money collected was delivered by one of the children to a house half way down the Main Street where it was collected by the mobile Bank. The money was laid on a table covered with a chenille table cloth to protect the surface - child labour obviously still existed in the early 1960s. J McCallum who had a Milliner & Dressmaker shop on the corner of Main Street and Newton Stewart Road was also a 'Howdie'. The Howdie was the mother-to-be's main attendant. Howdie is an old Scottish term for "handy woman"
and just as important instruct them of the rituals needed to keep both mum and baby safe. and then unlock all windows and doors. This was believed to help babies passage into the world easier. Mirrors where turned or covered, so babies soul could not be trapped in them. For a similar reason all bottles where uncorked. this would be whiskey, butter or salt (depending on area). This was done to ward of the evil eye. and every woman present would take three spoonfuls. This was thought to give baby strength and luck. this was also done by the howdie. and its growth would represent the child's life. Tall and straight tree......Healthy and strong. Sickly tree......Weak and early death. In the 1800's Kirkcowan was advertised as a village with dressmakers, tailors and as a centre for hand made corsets - how times have changed. Many years ago Hogmanay was celebrated by dragging a blazing barrel of tar up Main Street. This event was organised by the local 'Oddfellows'. I don't think there is even much first-footing these days, never mind blazing barrels of tar. Two trees were planted on each side of the Newton Stewart road, just beyond the garage, to commemorate the battle of Waterloo. Only one of them remains today. Bobby Drysedale used to have a pet fox. CROSHERIE PLANTATION - (more commonly known as the Jenna Morra). Did you know that the wood is called the 'Jenna Morra' after a 'lady of the night - probably of the day as well' who plyed her trade here. I wonder if all the good folk of the village, who used to stroll through the wood on a Sunday after attending church, were aware of this? Mining took place in the 1800's near Waulkmill (it is believed that the actual site is in the Crosherie Plantation (Jenna Morra). Copper ore was mined as Malachite. There also appears to have been a large quantity of silver found in one of the samples which compared favourably with samples from the Wanlockhead mine. Although a company was allegedly formed it was only ever mentioned once in the local paper (Free Press) so it has to be assumed that the project was not sucessful. There may still be a rich vein there waiting to be discovered. Millworkers used to be woken up by a man walking up the street blowing a bugle - no need for alarm clocks in those days but at least it got 'most' of them to work on time and those who didn't were probably sacked. Teapot Close, Bell Flynn Lane, Logans Alley, Milroy Terrace and The Straights. - what others do you remember ? HEALTH - In 1891 11 people died from measles and 6 from influenza. BARNEARNIE - in 1797 a James McGeoch lived at Barnearnie - Is he a direct relation of the current owners ? CORONATION YEAR - in 1953 the Queen's cavalcade drove through Kirkcowan on the way to Stranraer Cattle Show. The school children lined up along Church Street to wave. 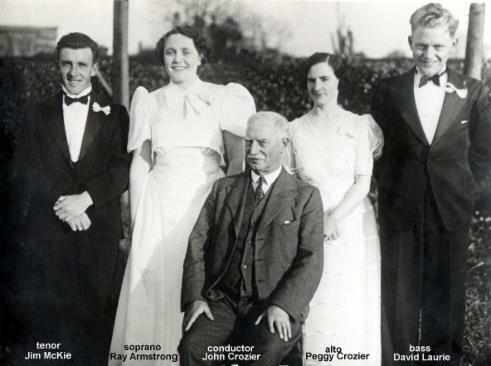 MUSICAL HISTORY - Kirkcowan has a long musical history, much of it thanks to John Crozier, who formed the Kirkcowan Musical Society whose first performance was on 27th March 1903. In order to accompany the choir he persuaded family and friends to learn to play musical instruments for his orchestra. Quite an achievement for such a small village. 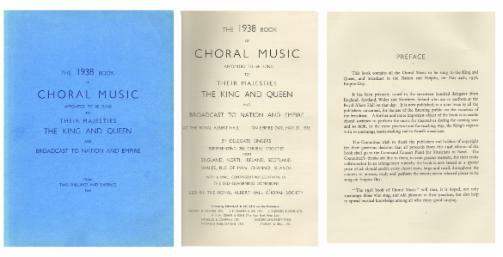 In the May 1938 County Festival Kirkcowan Choral Group gained more points than any other choir and as a result were invited to send four of its members to take part, with representatives from choirs from all over the UK and the Commonwealth, to perform at London's Royal Albert Hall on Empire Day 24th May 1938 in front of King George V1 and Queen Elizabeth. 288 Choral Societies were represented and the concert was broadcast to the Nation and the Commonwealth (just imagine the excitement of the proud people of Kirkcowan huddled in front of their wireless sets). The four lucky choir members were Ray Armstrong (Soprano), Peggy Crozier (Alto), Jim McKie (Tenor) and David Laurie (Bass) and they, along with other representatives from Scottish Choirs, sang 'Scots Wha Hae', Ca' the Yowes tae the Knowes' and 'A Hundred Pipers'. The scene inside the Royal Albert Hall must have been a 'mind blowing' experience for them as this rather blurred photograph shows. As well as the choir areas behind the stage the whole floor was taken up with singers. 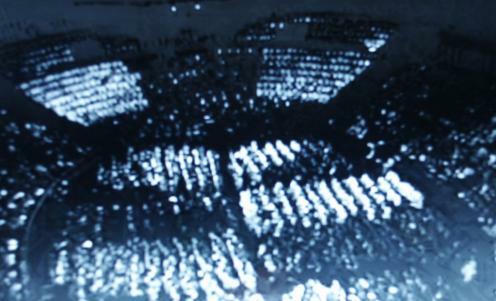 All 1700 or more singers sang 'Jerusalem' as the finale. Amongst the conductors for the concert were Malcolm Sargent and Henry Wood (founder of the Proms). The programme rather strictly announced ' No encores whatever can be given. Applause may well be STRONG but not LONG'. A book of the Choral Music was published and a copy sent to every single one of the1700 delegates representing 288 Choral Societies from Scotland, England, North Ireland, Wales and the Commonwealth. 1. The majority of the original old buildings in the Main Street are 'B' or 'C' listed as well as the Manse. 2. The present School building at Kirkcowan will be 150 years old in 2012. 1. John Crozier, who formed the Kirkcowan Musical Society played outside right in the first football team to be called Tarff Rovers in 1874. 2. In the 1956/57 the Douglas Ewart High School Intermediate XI football team won the Hunter Shield and Stewartry Cup - six of the players in the team came from Kirkcowan : Lindsay Tolland, Hugh McNeill, David Rae, Malcolm McCutcheon, John McKie and John McCutcheon. 3. In 1978 the Douglas Ewart team won the Dumfries and Galloway League, helped in no small part by five boys from Kirkcowan - Hugh Rennie, Stephen McKie, Willie McMillan, Andrew Wyllie and Gary McKie . 1. In the 1956/57 school session a 'Top of the Form' contest (popular radio programme of its day) took place at Kirkcowan. Four teams of four pupils took part and the contests were between Newton Stewart and Kirkcowan. Unfortunately for Kirkcowan, Newton Stewart won in all sections. 1. Does 'Greaser' remember falling over the bridge when he was trying to tip a heavy stone in to the water - unfortunately it took him with it ! 2. Jack Parker was hero of the day when he fished out Margaret Paterson from the water after she fell in. Just heard that this dramatic rescue actually happened on the Crosherie Moor when the group were looking for tadpoles. Margaret got stuck in a bog and was pulled out by Jack. Still dramatic stuff for a 7 year old. There were no doubt several near misses at the pool and weir at Lincuan Bridge over the years - it was a great place to guddle for baggie minnows and for walking across the weir, having slid down the steep embankment to get there (I talk from experience).